There are only 24 days of “hot” weather in Barrow, Alaska, the northernmost city in the United States, where hot and sunny means slightly above zero degrees on average. Other than that, it’s a bit chilly up there, 320 miles north of the Arctic Circle. In fact, it is by many accounts one of the coldest places on Earth. Yet, against all odds, people live there. Inuits, who have been living here for more than 15 centuries, call the place home. And on his way home on a clear day in 1969, when the sky was blue and the weather just fine enough for a man to throw a quick glance at the horizon to see something more than just the usual blizzard blowing in his face, one man did just that and saw a boat in the distance. At first, the man didn’t think it was something out of the ordinary. On the contrary, boats appear frequently, or at least as frequently as conditions allow. The region is in part industrialized from 1959 onward and serves as an economic hub in Alaska, but still, the only way in and out of this place is by boat and a risk for those willing to take the ride. An airplane is an option as well, but then there is the wild frost and windy weather. Boats can endure it, but flying is usually a no-no. After a while, the man realized the boat was not moving but seemed stuck in an Arctic ice pack in the Chukchi Sea, so he rushed to tell someone about it. When other men came, the boat was already gone. According to the description, the closest match was a 230-foot long and 1,322-ton cargo steamer that had been abandoned by its crew a long time ago and was last seen drifting through the Beaufort Sea in 1962. What the man allegedly saw was believed to be the legendary SS Baychimo, the Mysterious Ghost Ship of the Arctic that’s been roaming the seas unmanned for decades. First and foremost, abandoned ships never “roam the seas.” Its a nice description for a so-called ghost ship, but they never do, really. They move with known currents and in time either rust and sink to the bottom of the ocean or, as in this case, drift along and get stuck in ice-packed areas and get seen and reported by living people. This one was last seen in 1969 by the aforementioned man, who allegedly saw this boat off the shore of Barrow. It hasn’t been seen since, but no traces of a rusted sunken ship have been discovered along these known currents either. But let’s rewind and try to tell the story as it deserves to be told, in reverse. There is not a single sign today of a sunken vessel matching the description of SS Baychimo. There are no traces of wreckage nor scraps of metal floating in the Arctic waters. The Alaskan government in 2006 formed a search party and called for a thorough hunt in an attempt to finally solve the mystery surrounding this ship that allegedly hunts the northern seas. But it was to no avail. A decade had passed, and despite concerted and all-out efforts, nothing was found. The same year when this long-lasting search party was set in motion, author Anthony Dalton wrote and published the book Baychimo: Arctic Ghost Ship. It’s an accurate exploration of every myth and fact there is about the elusive abandoned ship that’s been spotted a couple of times drifting in the Beaufort and the Chukchi seas, thus playing with people’s imagination for decades. He claims that although the vessel is still considered to sail the icy waters near the north pole, it has probably sunk already but no one can guess for sure when and where exactly. “It would seem likely then that the ice finally tired of ferrying Baychimo endlessly throughout its domain, and squashed her. The end would not have been pretty. Ships crushed by ice rarely go quietly. The encroaching ice distorts the hull with uneven pressures, stealing its integrity and making it scream in agony,” he explains, thus anchoring an incentive for some to try and find it. Yet, no real signs of an agony were ever found. According to Dalton, the events that took place in 1969 were not credible enough and he takes another report from 1962 as the last official sighting of the ship, when as he tells us “a party of Iñupiat in kayaks glided silently along a lead on the Beaufort Sea, just offshore from the north Alaskan coast,” and saw a ship drifting near the coast with the name “Bayachimo” written on it. At least it was according to their official reports they gave right after the incident. The boat was gone immediately after, probably from where it came almost two and a half decades ago when according to multiple accounts it was last boarded by captain Hugh Polson. He allegedly saw the ghost stuck in a gigantic iceberg and wished to salvage anything left salvageable out of it, but it was November, winds had changed, and he didn’t make it in time. He was risking both the newly discovered and his own ship’s fate, as well as his life, so he did what anyone with a sound mind would do. He left the boat and went back to his own to wait for finer weather conditions. It was a story first told in 1973 by Paul Brooks for British Columbia Magazine and repeated several times over the years. Then again, it was November and it was a story of a captain sailing through the Arctic–in November, most of the Arctic Ocean is either frozen or covered with huge portions of solid ice during the month. And in 1939, when ships were nowhere nearly advanced as they are today and global warming was an ice-melting threat still not heard of. So how did one captain and a daring explorer manage to break through the ice-frozen sea, discover an alleged ghost ship, and then report that when the weather conditions got slightly better and he could see a bit more than just a blizzard blowing in his face, the boat was gone and there was nothing there left to see. No one knows for sure, really. And its a question troubling many who tried to examine the report and the stories that were written around it and the legendary SS Baychimo. Including Anthony Dalton, who offers some plausible scenarios of his own that potentially caused a massive misconception. What’s known for sure are the facts about the ship’s origin, its name, and how and when exactly it came to be abandoned by its crew. The ship was constructed in the early 1910s in Sweden and launched in their waters in 1914, but after World War I was bought by the Hudson Bay Company and renamed from Ångermanelfven to SS Baychimo. No longer was its usual trade route from Hamburg to Sweden and back. It was now going to be from Scotland to the north coasts of Canada and Alaska, and a trip back home. 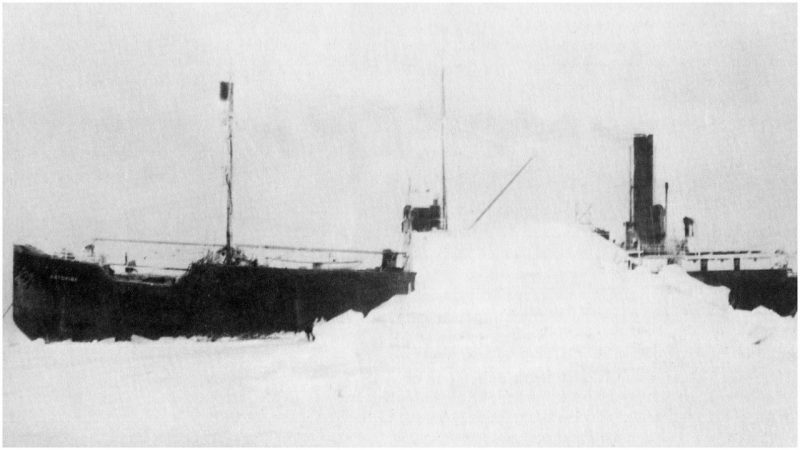 Unfortunately, during one of the usual routes, on October 1, 1931, the ship got stuck between huge ice packs near the coastline of Barrow, Alaska. There was a huge storm and no way out for the crew. They had to wait out the storm. Days turned into nights, nights into weeks, but the storm was nowhere near its end. Just when it got a bit clearer, some of the crew were transported to safety in Barrow by airplane, but not the captain. He and a few other brave men stuck around and made camp in the vicinity. They were willing to wait out the storm and be there when the salvage crew arrived. It was October 15. But the storm got even worse and there was no sign of help nor a crew to salvage the boat, or salvage them at least at this point. It was freezing cold, and the wind was so harsh they couldn’t even see more than a couple of inches in front, let alone the boat nearby. On November 25, worst came to worst. The blizzard stopped, but the ship was nowhere around. They believed it had sunk along with the cargo and everything else. No more than a week later, a local from Barrow rushed to the captain and said he saw the ship drifting nearby. The boat was found, but believed to be so heavily damaged that it was about to sink anytime soon. Yet, it did not, it seems. The story that the ship was seen stuck to a huge pack of ice, drifting in and out of sight, went on for years and grew into a legend, the legend of the SS Baychimo, the Mysterious Ghost Ship of the Arctic, that’s allegedly been roaming the seas unmanned for decades. Not long ago, the BBC, for the purpose of Deep Ocean, the second episode of their remarkable Blue Planet II series, sent a crew under the ice in Antarctica to explore the depths. During the episode, the crew said that the greatest threat to them and their lives was if two icebergs were about to collide. “The decks buckle, planking shattering louder than a volley of rifle shots. As the funnel collapses over what’s left of the deck, it tears itself from its footing with mind-jarring squeals. Slowly, with no let-up in the terrible cries, she settles as the freezing waters invades her privacy. With a dreadful sigh, she goes under, and the ice closes over to seal her tomb.” – Anthony Dalton, Baychimo: Arctic Ghost Ship, about cases such as this and a probable scenario of what might have happened to the long-lost ghost ship and why there are no traces left behind. At the end, “all loose things seem to drift down to the sea, and so did I” – Louis L’Amour.